A recent discussion on Neogaf has brought out some new details to Skyward Sword. Most of this information pertains to stuff we already knew, but some of it is an elaboration and goes into more details. The information provided in this update can be considered a spoiler so if you would like to read it then click the icon below to read more. 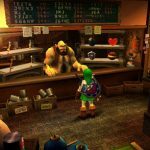 As we have known for a while now, Beedle’s shop will be making another appearance in Skyward Sword. However this time it is in the form of a floating house in the Skyloft area. 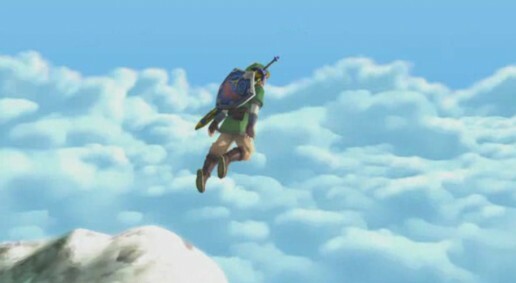 To enter his house Link must ring a bell which will drop a rope for him to climb. Inside of his house is a bed which Link can sleep on to change from day to night. If you try to exit without buying anything then Beedle will drop Link out the shop through a secret hatch. Link can get some medals from Beedle’s shop. So far we know about a Life and Bug Medal. The Life Medal’s function is unclear as of now but the Bug Medal reveals bug locations on your map. The Life Medal costs 800 Rupees. 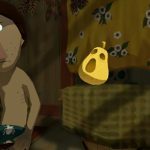 At night Beedle lands his shop on a small island with a locked chest. To open it Link needs to find a Goddess Cube. Once beating the first dungeon Link can start a variety of quests. One sidequest can be found in the graveyard. By ramming into a headstone a secret passage will appear. Inside is a demon who wants to become a man. 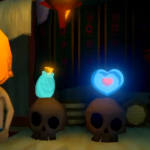 To turn him into a man you must bring him Gratitude Crystals which look a bit like Starbits from Mario Galaxy.